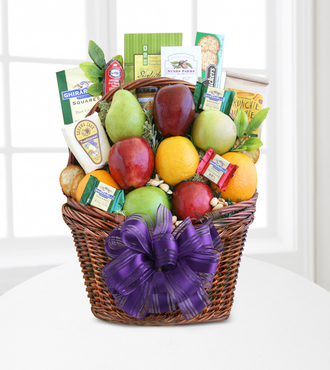 The Fruitful Greetings Gourmet Gift Basket is the perfect way to spread delicious color and happy greetings to family, friends and co-workers. This basket includes 9 pieces of fresh seasonal fruit, Sonoma cheese, crackers, California almonds, salami, English tea cookies, Nunes Farms snack mix and Ghirardelli chocolate squares. "Flowers Fast exceeded my expectations. I placed a holiday order on Saturday and delivery was made next day, on Sunday. This is unheard of with other online flower services. Extremely pleased with service." -- Kelly K.